>We sold our 2nd car back in October and I’ve been commuting to downtown via bike since then. I just crested 1100 miles on my bike since October. I’ve lost weight, my blood pressure is way down and overall I am in much better physical shape. One of the things that I look forward to on the last Friday of the month is Shift’s (http://www.shift2bike.org/) Breakfast on the Bridges (BonB). 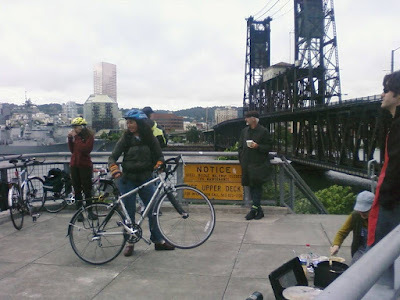 Just before I ride over the Steel Bridge, I am greeted by friendly folks with hot coffee and some random breakfast food item (mostly pastry). Well suprise suprise suprise this morning when I was greeted BonB folks! In addition to the normal cup of coffee I enjoy with the BonB volunteers they were had pancakes, cupcakes AND BACON!! mmmmmm….bacon on bridges. They were there as part of Shift’s Pedalpalooza event that goes from June 12th to the 28th (more info HERE). This entry was posted in Events, Transportation and tagged Bacon, Bikes, BonB, Shift by Noah Brimhall. Bookmark the permalink. > I’ve lost weight, my blood pressure is way down and overall I am in much better physical shape.And it shows: you look healthier than at any time I’ve known you! Keep it up!